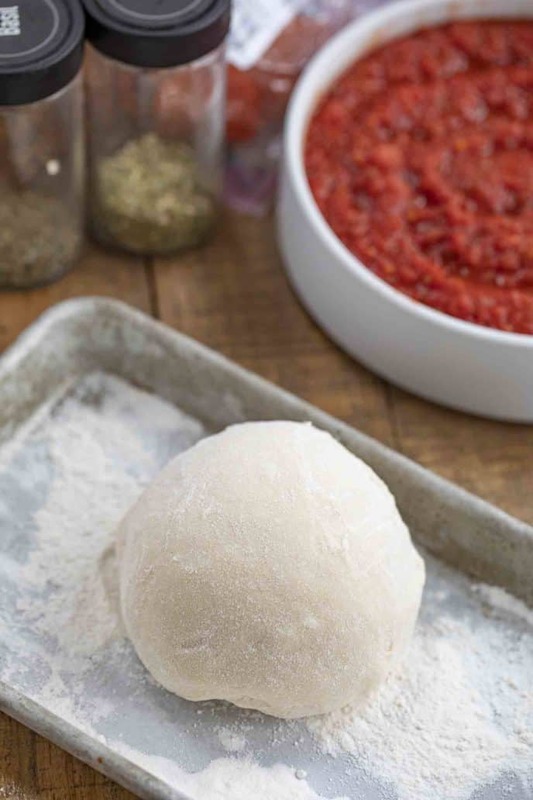 Easy Pizza Dough made with flour, yeast, sugar, oil, and seasoning takes your homemade pizza to the next level, ready in 45 minutes! 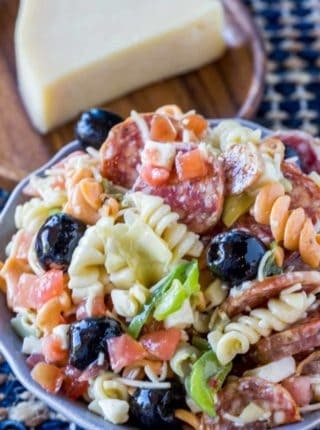 We love homemade Italian favorites including The Best Chicken Parmesan, Easy Bacon Carbonara Pasta and Ultimate Meat Lasagna. Easy Pizza Dough is one of my favorite go-to recipes when I’m craving a slice of hot, cheesy homemade pizza. 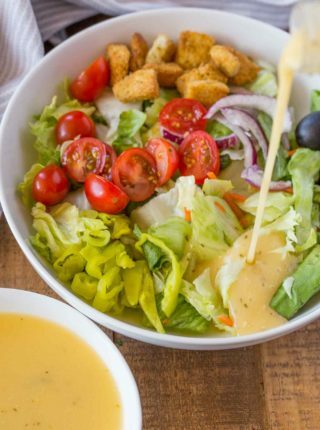 It’s really flavorful and easy to make. You can make this the day of or days ahead of time, either as dough or a pre-baked crust. I use this recipe to make calzones in addition to regular pizza, and it beats store-bought every time! HOW DO YOU MAKE PIZZA CRUST CRISPY? Make your pizza crust crispy by rolling the dough out on the thinner side. Be careful not to make it too thin, because you don’t want it to fall apart when you add the toppings. Pre-bake until it’s slightly browned on the top of the crust, then remove and add toppings, then return to the oven to finish. You want your oven to be pretty hot for this step, at least 425 degrees F, to get a really crispy crust. For a crispy thin crust pizza, you can also skip the rising step and just roll the pizza out after you’re done kneading it. All purpose flour will also work for a thin crust pizza, instead of bread flour. WHAT TYPE OF YEAST SHOULD YOU USE FOR THIS PIZZA DOUGH RECIPE? 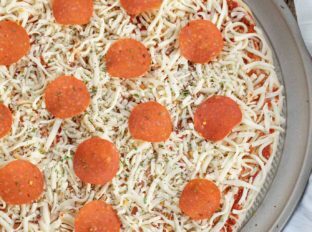 For this pizza dough recipe, you can use active dry yeast or instant yeast, but the active dry yeast may take a few more minutes for the dough to rise. The yeast needs a warm environment to make the dough rise, which is about 75 degrees F.
WHY IS MY PIZZA CRUST HARD? This can happen when your dough is over-mixed, making the gluten too tough. Hard dough can also happen when it’s too cold to work with, if you were storing this in the refrigerator beforehand. Let it warm up at room temperature before using it again. You also want to make sure that you’re measuring your ingredients correctly. Use a knife to level off your measuring cup, or try weighing your flour for the most accurate result. I always go for bread flour when I’m making this pizza dough recipe. Bread flour contains more gluten than regular all purpose flour, which gives your pizza crust that doughy, chewy texture. For a deep dish or a thin crust pizza, you can use all purpose flour, because they don’t require as much stretching in the dough. 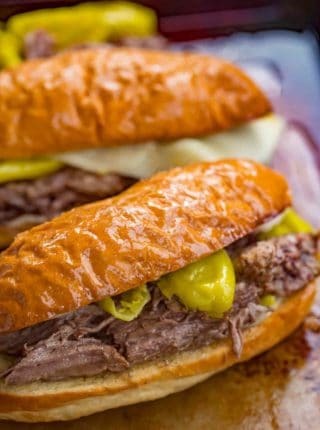 If all you have is all purpose, substitute 1 cup (14 tablespoons) of all purpose flour, plus 2 tablespoons cornstarch to make it more like bread flour. CAN YOU MAKE PIZZA DOUGH AHEAD? Pizza dough is perfect for making ahead and freezing. Make the dough and let it rise, then divide it into the amounts you’d need for one pizza. Roll into a ball, and spray lightly with olive oil cooking spray. Wrap tightly with plastic wrap, then place in a freezer bag and freeze for 2-3 months. When you’re ready, defrost in the refrigerator for a few hours before using. CAN I LEAVE PIZZA DOUGH OUT OVERNIGHT? Because this is still raw dough, I don’t recommend leaving this out overnight. After the initial rise, I would put this back in the refrigerator, and let it rest on the counter for 20-30 minutes before I start working with it again. HOW DO YOU STORE PIZZA DOUGH? You can store pizza dough in the refrigerator for about a week, coated lightly in oil and sealed with plastic wrap. TIPS FOR MAKING PIZZA DOUGH? Work on a lightly floured surface to keep the dough from sticking when you’re rolling it out. You can also dust your hands with flour or a little bit of olive oil. Add a dash of oregano or garlic to the pizza dough recipe to add more flavor. Don’t try to stretch your dough when it’s cold. Work with room temperature dough to get the best stretch. Top your homemade pizza dough with your favorite toppings. I like using marinara sauce, slices of mozzarella, tomato slices, fresh basil, and a drizzle of olive oil with a teaspoon salt. 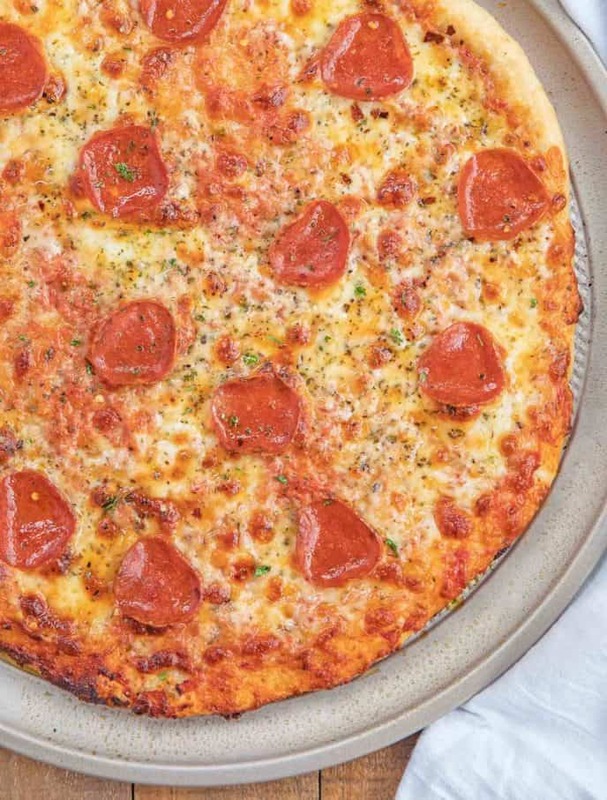 A pizza pan is convenient if this is your first time making this dough recipe, but if you’re making this on a regular basis, a pizza stone will conduct the heat better and give you a better crust. This recipe uses a little bit of granulated sugar, which helps get the yeast ready to go. You can use brown sugar if you want a little deeper flavor in the crust, too. You know the yeast is ready when the water is slightly foamy. How long this takes to bake at the set oven temperature depends on how thick you make your crust. The thicker, the more time it will need in the oven. We’re using the stand mixing dough hook to knead the dough. If you don’t have one, you can knead this by hand. Easy Pizza Dough made with flour, yeast, sugar, oil, and seasoning takes your homemade pizza to the next level, ready in 60 minutes! In a stand mixer mix the water, sugar and yeast together and let it sit for 10 minutes. Add in the flour, oil, salt and garlic powder and whisk together on medium speed until well combined, then swap out for the dough hook and let it knead for 5 minutes on medium speed. Remove the dough hook and let it rest, covered with a damp clean towel for 30 minutes before using. 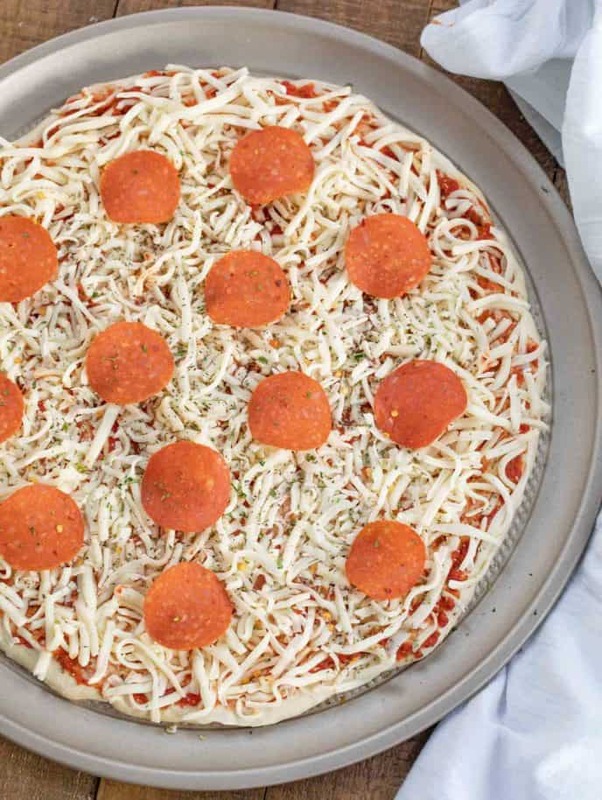 Roll the pizza dough out with a bit of flour and when ready to use bake at 425 degrees topped with your favorite ingredients for 10-12 minutes. Looking forward to trying your great pizza dough recipes!!! Thank you. Hi would love to try this. when you say to substitute 1 cup of all purpose flour with 2 tblsp of cornstarch do you mean 2 1/2 cups of flour with 2 tblsp of cornstarch or do you mean 1 cup of flour with 2 tblsp cornstarch for the entire recipe. sorry, just a bit confused. thanking you in advance. Sorry for the confusion. As a rule of thumb, you want to use 1 cup of flour plus 2 tablespoons cornstarch to substitute bread flour. For this recipe, you’ll use 2 1/2 cups of flour and 5 tablespoons of cornstarch. Hope this helps clear things up! Homemade pizza dough is the best! 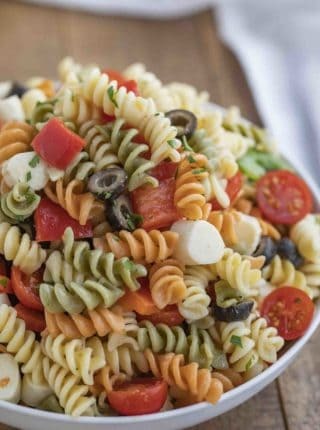 We love this easy recipe! We LOVE making pizza from home! Thank you so much! This recipe was amazing! So easy too! So glad you enjoyed it, Pam! I’m so glad you decided to give it a try!